Also check out tips for keeping your artist palette and paints moist. Acrylic paint dries very quickly, so it's important to make sure they don't dry out! I've tried out lots of different palettes, and safety glass is my absolute favorite. These artist palettes are nice and smooth, easy on brushes, and super-easy to clean. I keep the palette next to me on a table while I work. The size is perfect, allowing plenty of room for mixing colors. It has a white vinyl backing, but mine came undone after washing the palette for the trillionth time. No problem though - I just peeled it off and now keep a plain white piece of paper or mat board underneath the safety glass palette. Works like a charm! The best thing about this artist palette is that it is glass, yet if it breaks, it will not shatter everywhere and cause injury. I accidentally broke one once, by dropping it into the sink (it wasn't the first time that I dropped it, so it does have a strong resistance) and the glass sort of crumbled in on itself instead of shattering. It was all still in one piece, so it was easy to toss it in the trash. I suppose I could have saved it and reused it for something artsy... now there's an idea! On the right, you can see my safety glass palette and how I use it. When working photorealistically, I like having the colors right next to each other, to allow for easy blending. If I have to step away for more than 15 minutes, I empty my water container and put it upside-down over the paints. This keeps them moist while I'm gone! Final analysis: safety glass palettes rock! Plexiglass is made of clear acrylic plastic, so it's essentially the same as this palette. I mention it separately here, because you could often get a square of plexiglass fairly cheaply from your local frame shop. Before I used safety glass, I used a plexiglass artist palette. It was recommended by my art professor because it was similar to real glass, yet safer. It was a good artist palette overall, but the main downside was that it could be difficult to clean if the paint was allowed to dry on the palette. It would come off eventually, but after a lot of scrubbing! Glass can be used as a palette, because it is nice and smooth and the paint will wash off easily. However, it is the most dangerous option! If it breaks, the glass will shatter into tiny pieces and scatter everywhere, which can be difficult to clean up. You don't want to get tiny shards embedded in your feet for days after breaking one! So I wouldn't really recommend using a real glass palette unless you absolutely couldn't find anything else. And if you must use real glass, be sure to put masking tape around the edges, because the edges can be sharp. There are a few different types of disposable artist palettes available. Basically, they are sheets of specially treated heavy white paper that usually come in the form of a pad. You simply tear off one sheet at a time and discard it when you are finished. To be honest, I'm not really sure of the benefits of using disposable artist palettes, when real ones are quite affordable and last much longer. Also, these disposable palettes are only meant to be used once, which creates a lot of waste - not a very eco-friendly option! So, while I'm not personally a fan of disposable palettes, I'm including it in the list of palettes, just in case you might find some need or use for it. As mentioned earlier, one of the issues with acrylics is that they can dry out quickly. This means that if you mixed the perfect combination of paints to get a specific fabulous new hue, but you need to suddenly go away for a few hours or stop painting for night - your paints would be dried on the palette the next time you came back to them. This isn't an issue anymore with Stay-Wet palettes! There are a few different brands of palettes on the market that are designed to retain moisture, thus preventing your paints from drying out. These plastic palettes come with a lid and rectangular sponge wedges to keep the palette moist for hours at a time. Stay-wet artist palettes can certainly be handy, and some artists love them. I used one when I was an art student, but for me it wasn't that great. I would go days without painting and forget to rewet the sponges, and the paints would dry out and harden on the plastic. It's hard to correctly mix colors on a palette that has layers of color crusted into it - those other colors become seriously distracting. So I would suggest only using one of these if you know you'll keep up with it. However, if you do use one and the paints harden on the plastic, one trick is to paint pure white over the colors. When that dries, give it a coat of varnish to seal it off. It won't be a nice smooth surface for mixing colors, but it will save you from needing to buy a new palette right away. Clear acrylic palettes are essentially the same as the plexiglass that you can get from your local framer. This one is designed to look just like the iconic wooden palette from the days of yore - with the curved shape and hole for your thumb. For artists that prefer to hold their palette, rather than rest them on a table, these clear acrylic palettes would make a nice, comfortable surface for mixing paints. As I mentioned earlier regarding plexiglass, these clear acrylic palettes can be a bugger to get clean if the paint has hardened on it. A bit of rubbing alcohol might do the trick though. Here is another kind of artist palette. This one is in the traditional palette shape, with the thumbhole for easy holding. It's made of white plastic and contains a number of small convex "mixing wells". If you normally mix small (really small) amounts of color each time, and want to keep them separate from each other, then this palette might work well for you. Personally I don't like the little mixing wells, because I like to be able to mix my colors together more easily and freely. But that's just me! Because it's plastic, you do need to be careful about not letting the paints dry on the palette, as it can be difficult to clean after the paint has hardened. A thorough wash after use should be fine! 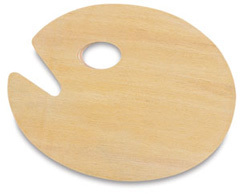 Here we go - the traditional, iconic wooden artist palette, as used by artists in the "old days"! I have to admit I have never used one of those, mostly because I figured once the acrylic dries on the wood, it's pretty much there forever. They say that these are easy to clean though, so it might be worth a try - at least just for experiencing how the Old Masters used to work! What do you do if you find yourself in the middle of nowhere, with a set of acrylics, a paintbrush and a canvas, but no palette? Let's say you really want to paint, too. Yes, this has happened to me, and after scrounging around for potential palettes, I ended up using old magazine pages. It's not ideal, but it does the trick if you've got nothing else. The magazine pages were strong enough that the paint didn't bleed through, and the surface was slick enough to allow for easy blending. Plus, it was nice to reuse the magazines and give them a second life. So, if you find yourself stuck without a palette, try using some old magazine pages! This is what I use to keep my acrylic paints from drying out. I fill this little atomizer bottle with water, and every so often I give my palette a spray. The bottle creates a fine mist that spreads evenly across the paints on my palette. I love it! It keeps the paints moist without drowning them. I highly recommend having one of these bottles on-hand if you paint frequently with acrylics. Another option for keeping your paints and palette moist is Liquitex Palette Wetting Spray. This spray not only keeps your acrylic paints moist; it also slows the drying time of acrylic paints and makes it easier to blend colors, working in much the same way as Acrylic Glazing Liquid and Acrylic Retarder. The main difference is that this comes in spray form, which means you get the added bonus of being able to spray it across your palette and even spray it directly on the canvas to keep the paints workable. Learn more about the characteristics and applications of acrylic paint. Interested in painting photorealistically? Check out my guide:How to Paint Photorealism: A Step-by-Step Guide on How to Paint Your Own Photorealistic Paintings. Check out this tutorial on how to paint abstract art with acrylics.